Weighted Gene Co-expression Network Analysis (WGCNA) This tool focuses on exploring correlation between probe sets in gene expression data, compared with available clinical data. 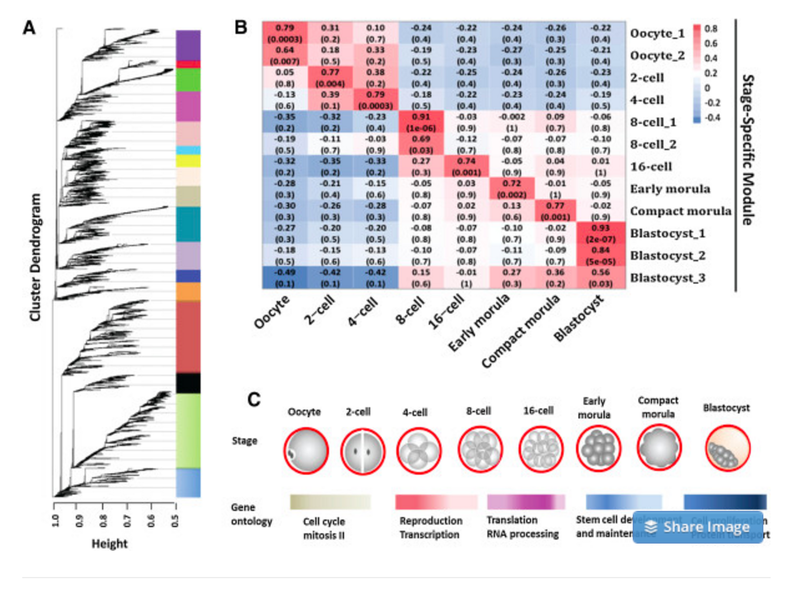 Original paper: Horvath et al, BMC Bioinformatics 2008, 9:559 doi:10.1186/1471-2105-9-559 'WGCNA: an R package for weighted correlation network analysis' The image to the left is from: Jiang et al, BMC Genomics 2014 15:756 doi:10.1186/1471-2164-15-756, "Transcriptional profiles of bovine in vivo pre-implantation development"
The updated version of the WGCNA app is now available for download! This eTRIKS Labs module is offered to the public as freely available resource, for non-commercial research use. Some aspects of this experimental module may still be under development, and there are no warranties about the completeness, reliability, accuracy, and security of the software package. Please bear this in mind, especially if you wish to analyse personal and/or confidential data.